For a quirky twist on the traditional floral gift, this teacup and saucer arrangement is pretty and fun too. We've chosen a stunning array of glorious textures in shades of feminine pink and cream. A wonderful centrepiece for any room that's sure to be a talking point. 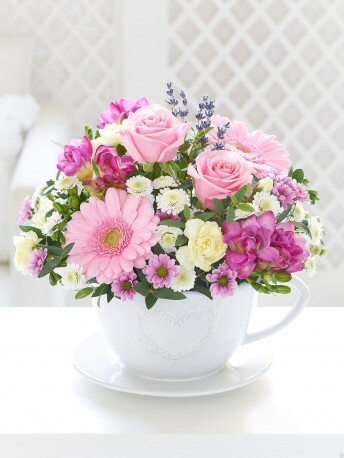 Featuring 3 cerise freesia, 2 pink germini, 2 large-headed pink roses, 1 pink spray chrysanthemum, 2 cream spray carnations, a white spray chrysanthemum with eucalyptus and lavender, presented in a charming teacup and saucer.